At home in Phnom Penh, the five techies knew of each other by reputation but had never hung out. After three weeks touring the United States, they’ve returned to Cambodia fired up about collaborating on a fintech startup. “Before, when I thought about a million-dollar business, it was only a dream,” Sopheakmonkol Sok, 29, a co-founder and CEO of Codingate, a web and mobile developer, told VOA Khmer. ​Langda Chea, founder and CEO of BookMeBus, a booking app for Cambodian bus, ferry and taxi travel, met Sopheakmonkol Sok while under the auspices of a U.S. State Department program called the International Visitor Leadership Program (IVLP), which includes work on democracy, human rights, security, environment, international crime, economic growth and development. The tech intensive “Accelerating Tech Entrepreneurship and SME Development” focused on small- and medium-sized enterprise growth in the tech sector. The Cambodians engaged with tech leaders in Washington, D.C.; Cleveland, Ohio; Raleigh, North Carolina; San Francisco and San Jose, California. Nicholas Geisinger, the IVLP program officer who oversaw the tech trip, said the program works when it encourages the cross-pollination of ideas among the exchange visitors and Americans. “Ideas were originated with the U.S. embassy … and furthering economic development in Cambodia was one of their objectives. … That’s why we did a program on this topic,” Geisinger said. Or as Rithy Thul, the founder of Smallworld, a collaborative co-working space, told VOA Khmer, the five learned “we can work together when we are back” in Cambodia. Or can they? Each one has a tech business, so who will run their fintech collaboration, the details of which they’re not disclosing, other than to say it is in the payment space. That remains under discussion. After three weeks, Chea said he was impressed with how various levels of government in the U.S. — local, state and federal — support startups. “The opportunities I see, including the cooperation between the government, the enterprises, and the incubation, which helps small business to understand its own business, to make it standardized in order to raise fund(s) or find investors,” Chea said. 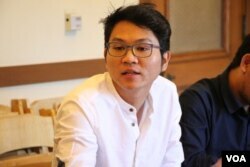 For example, the Cambodians and local tech types discussed how local firms and city government can support each other at the San Francisco Mayor’s Office of Civic Innovation (MOCI). 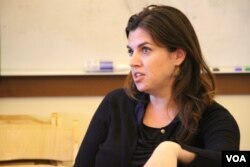 It is the only operation of its kind in the U.S., said Siobhan Oat-Judge, a Pearson fellow in the department that “connects government agencies with startups to develop technology products that address civic challenges,” according to the MOCI website. Helping startups to grow isn’t a one-way street, “the community as a whole gains from helping them since they bring solutions to problem. … It’s mutually beneficial,” Oat-Judge said. It’s more difficult to obtain funding in Cambodia than it is in the U.S., said Visal In, co-founder of KhmerLoad, the first Cambodian tech startup backed by Silicon Valley investors. For starters, there’s more U.S. money seeking potentially profitable ideas, something that In found when 500 Startups, a global venture capital based in San Francisco, invested $200,000 in his site.